Every four years or so something special happens in football that takes over the best part of a month between June and July. It keeps us occupied, it keeps us entertained and it keeps us sane when the usual football season would be over. Yes, it’s the World Cup. With the World Cup in Russia this time around, the kick off times might well end up during work hours or even worse, during the rush hour. Thankfully, we have an abundance of options to help you keep up-to-date with these games when you're on the go. Stay on the footy pulse with smartphones, tablets and laptops to make use of streaming sites and apps to watch the best tournament in world football. The ability to watch football from the palm of your hand is now easier than ever. With the latest Samsung flagship Galaxy S9, the large 6.2-inch Super AMOLED QHD+ screen allows for brilliant viewing so you can catch those special World Cup matches like Portugal versus Spain, Germany against Mexico and, er, Panama vs Tunisia? With 4K and HDR streaming – potentially – available, we won’t ever have seen the World Cup quite like this. The detailed S9 display should make picking out each player easy even on your phone. The S9 can be picked up for £869 and will make short work of providing you with special footballing moments – making that steep price worth it. If you’re in the Apple camp, the iPhone X can also deliver a similar streaming functionality. Albeit with a slightly smaller 5.8-inch screen, but tuned to perfection for crisp detail and vibrant colours. Being on a packed train when Harry Kane scores for England, you’ll be the envy of those around you. Tablets are also very handy when it comes to watching games on the go. Thanks to a slightly bigger screen than most smartphones these will let you watch the beautiful game bigger and better. The Tab S3 is one of the best Android tablets on the market, giving you a 9.7-inch QXGA Super AMOLED screen so you can view the players in great quality. A key feature of the Tab S3 is the split screen mode where you can simultaneously watch a game of football, while perhaps checking bets or keeping up on what social media is commentating on the match. For £599 the Tab S3 can be yours and with the function of quad speakers that will let you hear the vibrant atmosphere as if you’re in Russia, sort of. If this is too expensive, Apple has the 2017 iPad 9.7-inch available for a considerably cheaper £289. Another option, with a bigger screen of 12.2-inches, is the Acer Switch SW312-12. Operating on a Windows system, the Switch is available for £299. The bigger screen will definitely be a selling point for those wanting to see the players more clearly. If you’re stuck in a meeting at work or in the office on a lunch break when a big game is on, 4K laptops could be your best bet for watching the football. One particular 4K laptop is the Windows powered Lenovo Yoga 920. With a 13.9-inch display on offer, this is perfect for watching Lionel Messi and co via a BBC stream on your lunch break. The Yoga 920 has two JBL speakers so will offer great sound quality to make you feel as if you’re in the stadium. Available at a price of £1,199 the Yoga 920 is an investment worth making. Alternatively, you could use a MacBook Pro and while they don’t come with 4K screens as standard you can stream 4K on an Mac via a built in HDMI port that connects to a 4K TV. 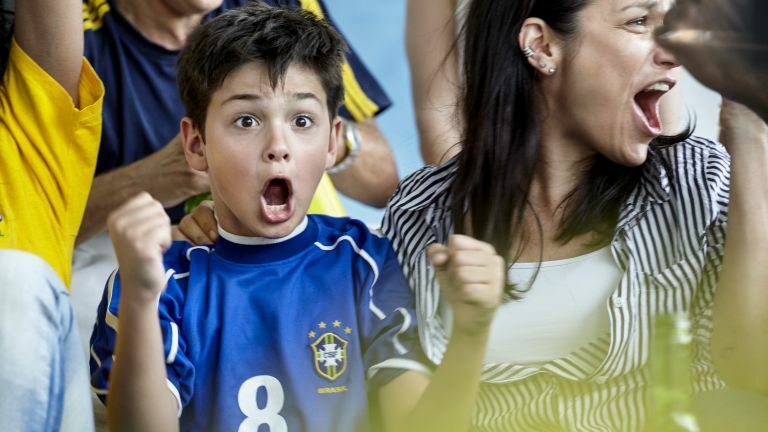 But what about if you’re lucky enough to be at the World Cup, what would be the best phone to capture those special moments? While the Samsung Galaxy S9 offers a solid dual camera, especially with the Super Slow-mo feature for 960 FPS playback, the Huawei P20 Pro represents good value for money. A dual camera and the ability to stabilise images makes the P20 Pro a great device for taking photos of your favourite footballers and moments. At £579 the Huawei P20 Pro is nearly £300 cheaper than the Galaxy S9 making it solid value for money. With the World Cup fast approaching, how will you be watching it?